2017 was a year of change, a year of great success, it was THE year for High Emotion Weddings. Everything that I had hoped to achieve in two years, I achieved in 2017 only. But more about that in a special article dedicated to this amazing year. Today, it is all about Erin and Danny and their beautiful, romantic winter wedding in Vienna. 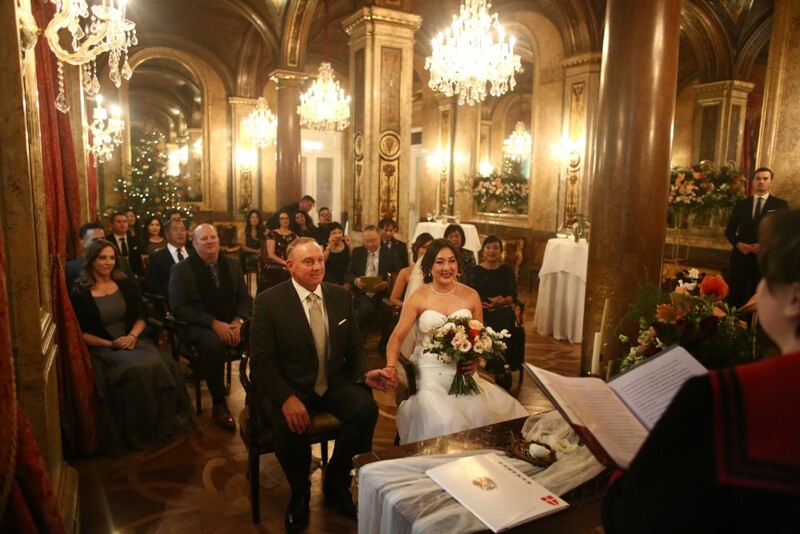 It was a pleasure to design it together with Hana from PONK Rentals and I am still in awe with the amazing warm atmosphere that we created in the Marble Room of Hotel Imperial for this intimate ceremony and dinner. There is one thing that gives a planner the certainty of a happy couple: TEARS! Yes, believe it or not, TEARS. Happy tears that start running when the bride enters the room because, everything has come together way better than she had ever imagined. Tears of joy when the bride and groom have their first look in one of the most spectacular buildings in Vienna. And then the laughter, the sound of happiness filling the imperial halls. Erin and Danny had booked an exciting Danube river cruise to visit all the gorgeous European Christmas markets. That's actually what triggered the brilliant idea of turning this trip into something even more amazing: saying YES in Vienna. So, this is how the wedding planning research started, and I am so happy they have found us to make their destination winter wedding come true in beautiful Vienna. We started planning in March, which gave us enough time to get all the paperwork for the legal ceremony, and to plan and design a cosy and charming celebration for their 18 guests. We created a very Christmasy atmosphere, with warm hues of peach, creme and gold, enriched with dark red amaryllis accents, all bathed in magical candlelight. On top of it all, each name card was a unique little gift to remind each guest of this special day on each Christmas to come: nothing else than calligraphed Christmas ornaments. This beautiful story also caught the attention of local television, so we had the pleasure to contribute to a report about Vienna, and generally Austria as one of the most beautiful European wedding destination. Thanks to Claudia and Kai for the great teamwork! And to end the story in the same #highlyemotional spirit, let's remember the poem dedicated by our officiant to the beautiful couple. who is happy that you exist. before you lose your courage. one who will bring light to your darkness. who will help you solve your problems.